Aloe Propolis Soothing Gel is made for all types of skin including sensitive and troubled skin types. 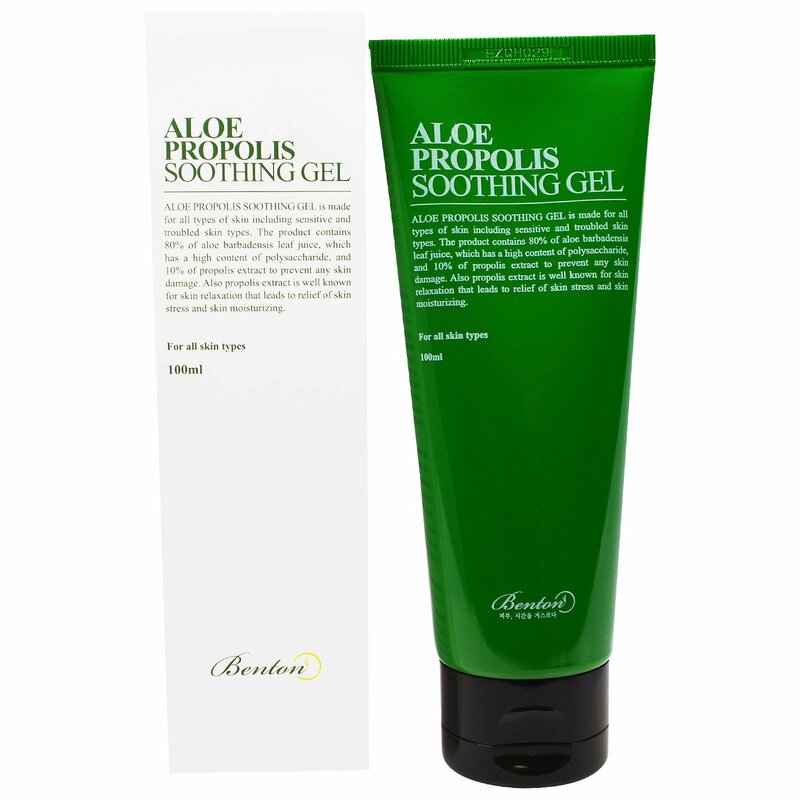 The product contains 80% of aloe barbadensis leaf juice, which has a high content of polysaccharide, and 10% of propolis extract to prevent any skin damage. Also propolis extract is well known for skin relaxation that leads to relief of skin stress and skin moisturizing. Apply suitable amount of gel and softly pat your face to absorb the gel. Inactive Ingredients: Aloe barbadensis leaf juice, propolis extract, glycerin, pentylene glycol, zanthoxylum piperitum fruit extract, pulsatilla koreana extract, usnea barbata (lichen) extract betaine, arginine, cucumis sativus (cucumber) fruit extract, portulaca oleracea extract, citrus limon (lemon) fruit extract, camellia sinensis leaf extract, chamomilla recutita (matricaria) flower extract, allantoin, acrylates/C10-30 alkyl acrylate crosspolymer. Expiration Date: 24 months from manufactured date. (Period of use: 6 months from opening). 1. In case of having following symptoms after using this, you're advised to stop using it immediately. If you keep using it, the symptoms will get worse and need to consult a dermatologist. 1) In case of having problems such as red rash, swollenness, itching, stimulation during usage. 2) In case of having the same symptoms above on the part you out this product on by direct sunlight. 2. 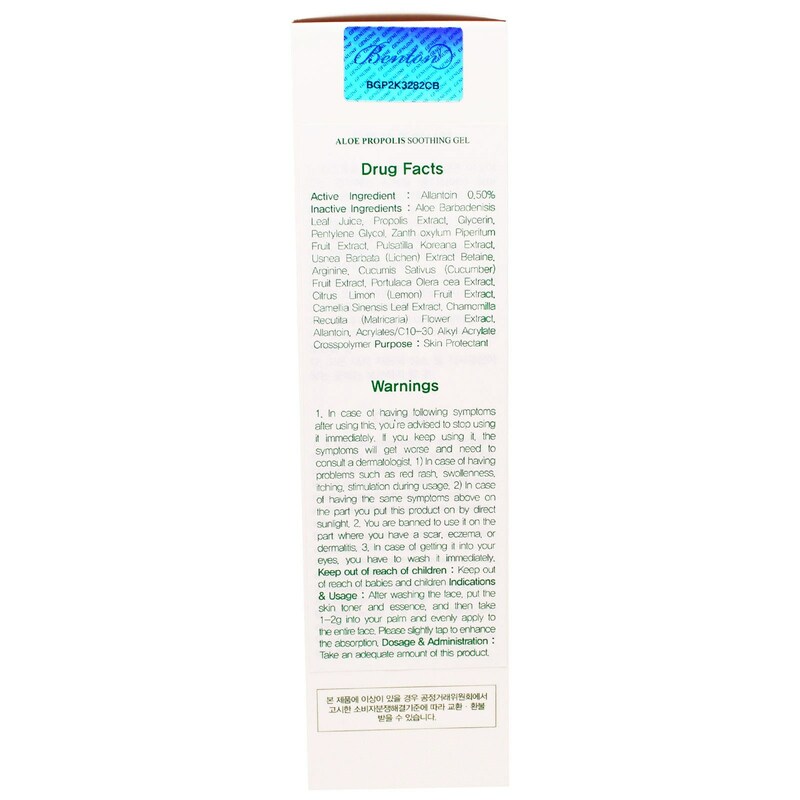 You are banned to use it in the part where you have a scar, eczema, or dermatitis. 3. In case of getting it into your eyes, you have to wash it immediately. Keep out of reach of children: Keep out of reach of children. Keep out of reach of babies and children. 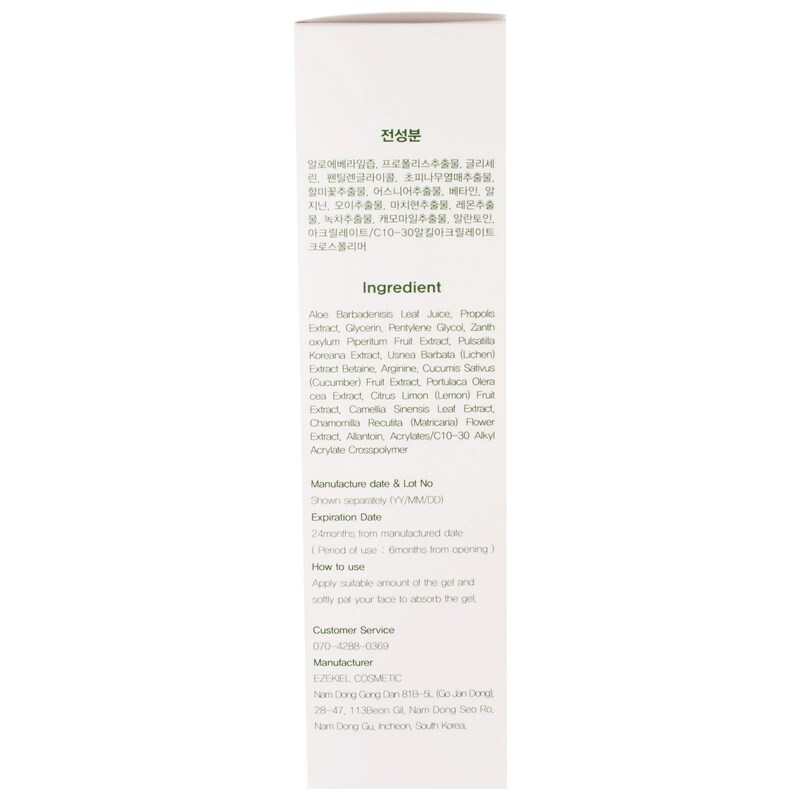 Indications & Usage: After washing the face, put the skin toner and essence, and then take 1-2 g into your palm and evenly apply to the entire face. Please slightly tap to enhance the absorption, Dosage & Administration: Take an adequate amount of this product.